More and more developers are starting to build Jailbreak detection into their apps. A Jailbroken device is classed by many (especially MDM vendors) as compromised. I think this is a fair approach to take, many corporates don't want the risk of devices with un-verified software running on their network. The problem with jailbreak detection is it can always be defeated. Due to the nature of Objective C it will always be possible to locate the method that is performing the detection and hook it so that it responds in the manner the original developer didn't intend. When I first started to look at this I wasn't aware of xCon, if you are not interested in how to defeat simple jailbreak detection and just want to get round some non trivial Jailbreak detection in an app grab it from Cydia. The guys have done a good job to cover a lot of apps and for most it works well. You will probably find that it works on some apps that aren't listed too. Create a patch with theos to hook it. Install & re run application. There is a long way to decrypt iPhone applications and a quick way. LightBulbOne's blog is a good read and has details on what to do if you want to try the longer way. I prefer the quick way (some might say lazy) using tools. The best tool I have found so far is clutch. Having done it the long way I would suggest you use clutch! You can find clutch out on the internets and on some Cydia repos, it's commonly used by "Crackers" to pirate apps so sometimes goes missing or gets taken down. To use clutch simply type the following at a shell prompt. # ./clutch "name of your app"
Clutch will then automagically create an .ipa file of your application which you can then extract the decrypted binary from. This is a pretty straight forward step, just use Cyberduck or SCP to copy the .ipa to a folder or location on your laptop you can easily access. Using your favourite unarchiver extract the contents of the .ipa to a folder. I just use unzip from a cmd line. There is a great tool called class-dump-z that if you have looked at reversing iOS apps before you will be well aware of. You will need to grab it from here. 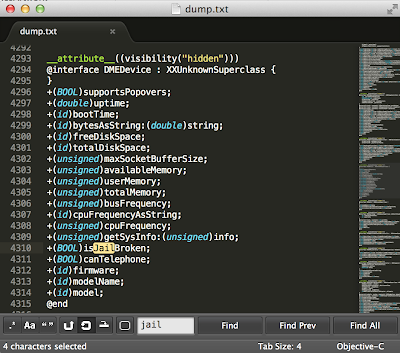 Next, open up the dump.txt file you just created using textpad or another editor. I have been using sublime recently and love it as you can set the language and get some colour coding to help you. Next look through the file or search for anything with "jail", "break" or "detection" in. Here we can see a class "DMEDevice" that has a method of type BOOL called "isJailBroken". Now we can assume as this is a BOOL type that it is going to either return false or true. If we can hook this method and force it to always return false then we can probably evade the jail break detection. This will launch the menu, select option 5 "Tweak" and then fill in the relvant details. It's a binary plist so you will need to use plutil that comes with com.ericasadun.utilities and downloadable from cydia. Simply type the following and then look for the "MobileSubstrate Bundle filter". Where <App Name> is the name of the application your are looking for. Next you will need to add the required code into the file Tweak.xm file in your project directory. UIAlertView *alert = [[UIAlertView alloc] initWithTitle:@"isa56k pwning..."
// The most important bit, return false and lie about the jailbreak status!! 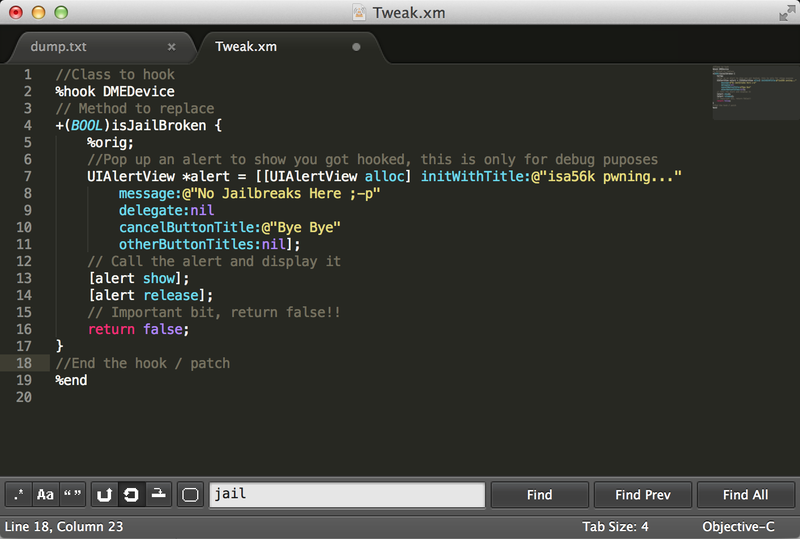 The most important part of the tweak is the really the final line of code in the function "return false". Every time that [DMEDevice isJailbroken] is now called in the application it will be replaced with our patch / tweak fooling the app telling it that it is not Jailbroken. I have included a UI Alert so that we know our patch is being run, without this it can be difficult to tell that it has actually been called. 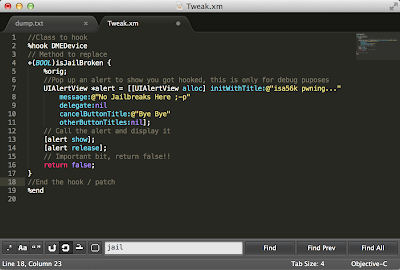 You could remove this code once you are happy your tweak is working. 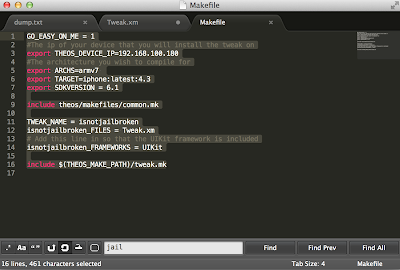 As we are using UIAlertView for a bit of debug we need to also include UIKit framework in our Makefile as well as a few other bits and pieces. 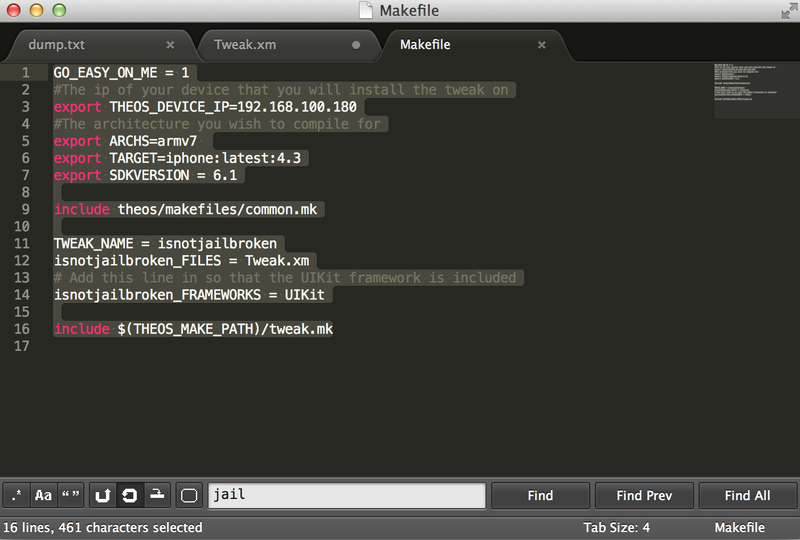 Open up the Makefile in your project directory and add the following (some will already exist). It took me ages to spot isnotJailbroken had an uppercase J when debugging an error!! This should compile and then install the patch on your jailbroken device. I have got public key auth set up on my iOS test device so that I am not prompted to enter a password, but you maybe prompted to enter your SSH password for the devices root account at this point. This is only very simple Jailbreak detection, other apps have started to mask when they are checking for jailbreak detection and exactly how they are doing it. I believe some MDM vendors regularly change the methods and the code that checks to keep hackers on their toes. Please please please do not run make with sudo. You aren't meant to; nothing in theos requires you to. If you get permission errors, you should fix them. Additionally, GO_EASY_ON_ME is evil. You should not ignore warnings, you should fix them. With that enabled you also think to ignore the warning output; this way you'll eventually make a typo and end up not noticing the warning about it.